Navigation signals and signs are one of the most very important subjects that you must learn when controlling your boat. There are lots of signs and messages that are global and some that only apply to certain rivers or canals. We will later in this article go through some of the most common signs signal and indicators. A classic is the Thames River Area. This is a very busy river and you need to prepare for the journey. Just take a look at the video below. You will also have to be aware of new signals, which even show a signal with a bail of straw, to show height during daylight hours. Also on certian rivers you will need to have a VHF radio. (see article regarding VHF radios). When you are on the water ways you will come across many signs however these are the most comon. Most are self explainatory however those that are not, require a little common sense as they will have extra information on them. 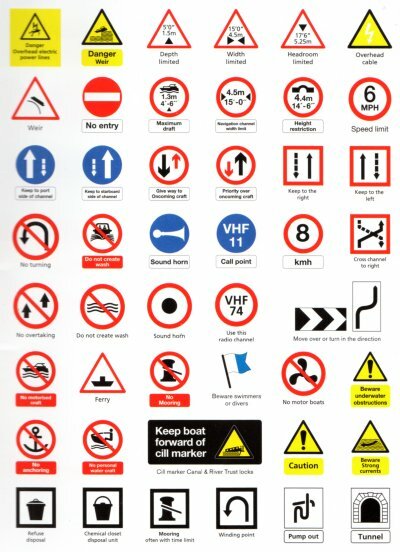 A lot of the signs you will see will be in this list however there are few that only appertain to the water you are cruising. These signs will be private or non standard signs like no mooring. However there are other signs that are produced by the Environment Agency for special uses. Alway take heed of any sign, but the round red signs are the most important like 'sound horn' as these are put there for a real safety purpose. Contrary to widespread belief, the single white light that fulfils requirements for navigation at night or in restricted visibility by a narrow boat on the English narrow canals does not fulfil legal (or commonsense) requirements on some larger CRT waterways or on many other freight waterways. If you are likely to be travelling at night on tidal waterways, as your movements may have been restricted due tide times. On such waterways, to travel at night in a power driven vessel, you MUST show the following lights, visible at the range indicated, when underway, as stipulated in the COLREGS (Rules 22 and 23). There are greater boat lengths in this legislation, however these will suit all narrowboats and common pleasure craft. For small craft (less than 12m in length) masthead and sternlights can be replaced by an all-round white light and sidelights can be carried in a combined lantern. For vessels less than 7m in length, sidelights are not mandatory but should be carried if practicable. Note the visibility requirements: many narrow boats are over 12m long so should be fitted with navigation lights. However many boat builders and fitters unfortunately do not seem to know or care about the regulations, so do not get fitted. On most larger waterways, including CRT commercial waterways, you are also required to show an anchor light when moored on the waterway at night – this is an all-round white light visible at 2 miles (or two lights visible at 3 miles for craft over 50m long) (Rule 30). The requirement for full navigation lights (with a few minor relaxations in some cases) applies to the following waterways. Note also that on all other CRT waterways, vessels other than narrow canal boats must carry both masthead light and stern light. * – a narrow canal craft need only show their headlamp and sidelights – but see note on headlights below. ** – a narrow canal craft need only show their headlamp and stern light – but see note on headlights below. Remember, no matter how small your boat, it is just as important that other boats can see you. When faced with a big ship in a sudden fog, you may end up wishing you had made sure you had fitted navigation lights. Although the rules are relaxed for narrow canal craft on some freight waterways, allowing use of a headlight instead of a masthead light, IWFG strongly recommends that, if you are venturing onto these larger waterways at night, you fit proper navigation lights and only use your headlamp occasionally, to pick out bridge details or when mooring, for example. The last thing a tanker skipper needs, when heading up the Aire and Calder Navigation at night with 600 tonnes of petrol, is to be dazzled by a small boat doing 6mph using a headlight with a beam designed for use on a car travelling at 70mph! Unfortunately, there are many narrow boats fitted with such a totally unsuitable light (in some cases even more than one!). On larger waterways at night, you will be navigating using lit marks or buoys, as will everyone else, and use of a headlight can cause a major hazard by dazzling skippers and pilots of oncoming craft.